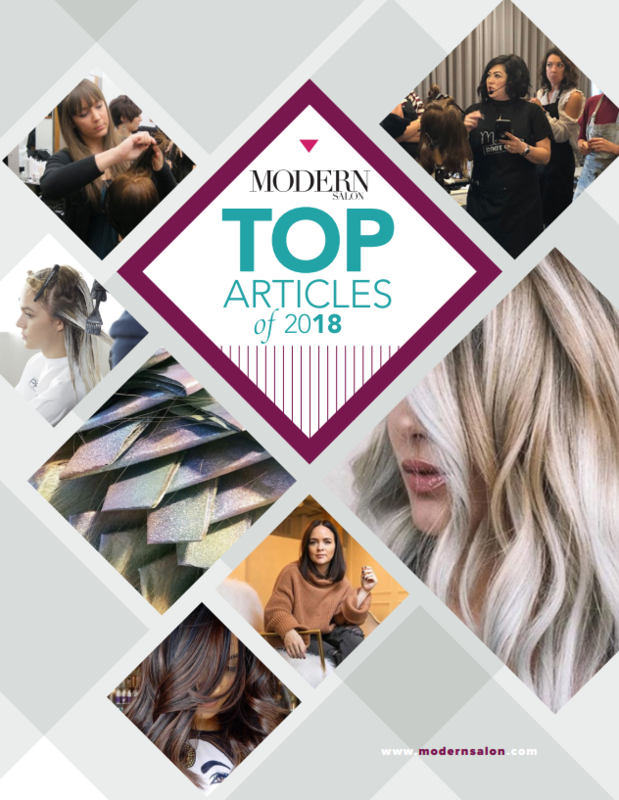 Robert Gardner (@robertgardnerhairstylist) of Goran Coban Salon, Chicago, Illinois, is a career colorist specializing in balayage, multidimensional beachy brunettes, sparkling blondes, and easy lived-in hair color. "This was my first appointment with this particular client. She is a natural level 2 and came to me lightened to a very warm and brassy level 8. She was wanting a very seamless, high contrast transition from scalp to ends. Her dream hair was a creamy vanilla finish with minimal warmth." Gardner believes that keeping things clean and simple is always the best approach. "Often times with color corrections we as hairstylist over complicate things. Simple is better. Almost always." Step 1: Using Redken ShadesEQ 8GN Ivy, apply a global application and process for a full 25 minutes. "This really helped neutralize the existing pre-lightened hair." Step 2: After blow drying the hair, balayage throughout using Wella Blondor ("my preferred lightener for balayage") and 40 volume developer (blended with Olaplex) placing in 2 inch sections. Continue throughout the back. Moving to the front, switch to horizontal 1.5 inch sections and work up to the top of the head paying close attention to to the hair line and “Money Piece”. Step 3: Process for a full 60 minutes, 30 of which were incubated under the Climazon. "Besides saturation, I feel the biggest mistake hairstylist make when lightening dark hair with balayage is not allowing the lightener to do its job. Resist the temptation to take the lightener off early." After rinsing I applied Olaplex number 2 And let that sit for 20 minutes. Step 4: On towel dried hair apply the first of two toner formulas. On zones 1 and 2 apply equal parts of 08N and 08V in Redken Shades EQ and process for 15 minutes. Rinse and towel dry to 80 percent. Step 5: Apply a global application of 1 oz. 09N, 1 oz. 09V, and 1/2 oz 09GB to blend everything together and to give this lightened hair a neutral creamy finish. Process for 7 minutes. Step 6: Blow dry with Oribe styling products and finished with a 1 1/4 curling iron.